Today we took a tour bus to the Joint Security Area – South Korea, Demilitarized Zone or short just the JSA in the DMZ as everyone calls it. But just to make sure it’s clear: The JSA is a small part inside the DMZ, which was intended for communication, negotiations and stuff like that. 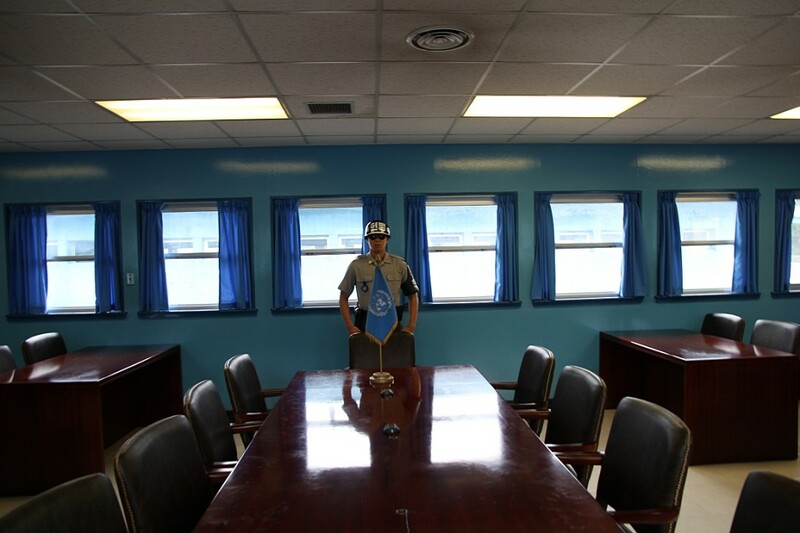 The only area where civilians can go to inside the DMZ and you can only go to one half – depending on the side you came from. Hardest part (for me) was getting up at 5 am to be in time at the USO (United Service Organizations) at Camp Kim in Seoul. From there – after showing our passport two times – we took off in two buses along the river towards the DMZ – where we had to show the passports once more. Before we report on the trip, lemme talk about rules. Rules are important and these especially. For once, you have to wear the right clothes. Or better said, you can’t wear the wrong clothes. Sleeves on shirts can’t be too short, legs need to be fully covered, as well as the feet (so no sandals) and no political or otherwise inappropriate messages on anything. No photographs towards the wrong direction, which mean no to the side you came from, so you don’t support the other sides espionage. No gestures, waving or finger pointing towards the other direction, as they could interpret that as insults and use it for propaganda (or as a reason to shoot you). Another thing is not a rule, it just doesn’t work there, so: No cellphone usage. During this trip we visited several points of interest inside the JSA, like the Panmunjeom, which is the part where both sides face each other from day to day. We saw some observation posts and from there the South Korean and the North Korean villages, which were intended as a step towards unification, but didn’t work. We saw the famous Bridge of no Return (something like in the James Bond movie, just that one was – of course – fake), but for some reason were not allowed to leave the bus and check it out for ourselves. And also we went to see a North Korean infiltration tunnel, which ended in a nice stiff march on an 358 meter, 11° incline. And finally we had lunch in a train station, along the rails which lead from North Korea to South Korea. Yes, it was finally some Korean meal: Bulgogi (which was quite mild, I’m used to stronger stuff). Anyway, that train station and the rails are actually in use, since there’s the Kaesŏng Industrial Park in North Korea where South Korean companies can produce with North Korean workers. Since we’re talking about money here, this might be a way of unification that could work in the end. Oh and why “Back from North Korea (kinda)”? Well, since the JSA has two sides, but a common meeting area for negotiations and stuff, we could walk a few meters inside that building to the North Korean side (till they kicked us out). After that, we got back to Seoul for a coffee, early leisure-time and a welcoming “Hey, you did not get shot!” by owner of our hostel.